Brighton & Hove Albion crashed to their heaviest defeat at the Amex when they lost 5-0 at home to Bournemouth. Here's six things we learned from the game. Brighton's home form at the Amex after promotion to the Premier League was outstanding for the first 18 months. Albion lost just six of 29 home matches up until the start of 2019. Since then, the Seagulls have lost four of six games at the Amex and have beaten only rock-bottom Huddersfield at home in 2019. 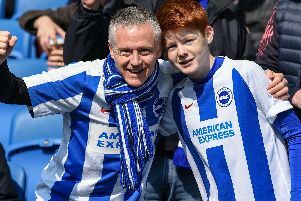 Many fans felt Albion would comfortably avoid the drop at Christmas because of the run of home games in the final couple of months of the season. But defeats to Burnley, Southampton and now Bournemouth and a draw with Watford leaves them nervously looking over their shoulder. There were boos at half-time and again at full-time as Albion failed to test Bournemouth keeper Artur Boruc on an afternoon to forget. Cardiff are the visitors to the Amex on Tuesday and Brighton also still have to host Newcastle. Albion have to produce a much better display than Saturday to ensure they will be in the top flight for a third successive season. Time to revert to last season's formation? Albion boss Chris Hughton has kept faith with a 4-3-3 formation for the last few months but you wonder if he'll soon be tempted to go revert to the 4-4-1-1 of last season. Hughton switched formation so that Brighton would be more of an attacking threat and create more chances. In recent weeks though, Albion have conceded too many goals and not taken - or created - enough opportunities at the other end. Cardiff visit the Amex on Tuesday in a game Brighton can't afford to lose. The return from injury of Pascal Gross and Solly March could be timely for the Seagulls as they bid to end a four-game winless run without scoring. Chris Hughton opted to go for pace in the attacking areas but Brighton failed to create any clear opportunities against Bournemouth. Florin Andone and Jurgen Locadia came into the starting line-up for Glenn Murray and Alireza Jahanbakhsh in the only changes from last week's FA Cup semi-final. Despite plenty of willing running from the duo, Albion failed to test Bournemouth keeper Artur Boruc. Murray replaced Andone just before the hour - to boos from some Albion fans who wanted to see the duo play together - but the Seagulls still didn't look like scoring. A total of 17 goals from their 16 home league games this season tells its own story. Albion quickly have to turn things around to make sure they avoid the drop. Gross key for the Seagulls? Albion have failed to create many chances in recent weeks and have missed the creative influence of Pascal Gross. The German midfielder may not have quite hit the heights of last season when he scored seven goals and provided eight assists but he is still Brighton's most creative player in the final third. Albion fans will hope the 27-year-old is back available for Tuesday's match with Cardiff. Brighton managed just eight shots against Bournemouth yesterday and Cherries keeper Artur Boruc had just one save to make. A fully fit and on-song Gross could be the difference between Albion ensuring survival sooner rather than later or staying involved in a relegation scrap that goes right down to the wire. Anthony Knockaert quickly went from the highs of football to the lows in the space of seven days. The French winger starred and was named man-of-the-match when Albion lost their FA Cup semi-final to Manchester City at Wembley last weekend. He then picked up the March goal of the month award on Friday for his stunning strike in Brighton's 2-1 win at arch rivals Crystal Palace. However yesterday he was in the headlines for all the wrong reasons when he was shown a straight red card for a reckless foul on Bournemouth full-back Adam Smith. BBC pundit Dion Dublin said it could have been a career-ending tackle and Knockaert will now have to watch from the sidelines for the next three games. He has been a key player in recent weeks and will be a miss for the games with Cardiff, Wolves and Tottenham. Brighton were punished for their mistakes in the defeat to Bournemouth who were clinical with their chances. The Cherries' first goal came when Shane Duffy's attempted crossfield pass was cut out and Bournemouth broke quickly and Dan Gosling tapped home from Callum Wilson's pass. Anthony Knockaert gave the ball away on the halfway line for the second when Ryan Fraser lobbed the ball home. Knockaert's frustration soon boiled over when he was shown a straight red card for a wild challenge on Adam Smith and the Cherries ran in three more goals through David Brooks, Callum Wilson and Junior Stanislas. Albion have to quickly move on as they have six huge games left to seal Premier League safety.